This afternoon I was sitting around lamenting through a skull-splitting brainache about all my lost potential shots this past month. Homemade pasta with bacony meatballs, spinach and ricotta gnocchi in butter sauce, grilled lamb with perfectly smooth potato puree tossed with Washington State University Cougar Cold Cheese, adorable little maraschino cherry tea cakes, specialty pizzas, multiple vegetarian dishes, and a date cake with caramel frosting from a 1960s recipe. All lost because I was on hiatus with too much to do to set up the shots. While sitting there annoyed at myself for being the human I cannot help from being, my cooking buddy Kim left a comment on this Stromboli over on MySpace. I had completely forgotten about it until she brought it back into view. I suddenly felt a little bit better, like opening up a surprise package of work already done and waiting for me. So here it is, it may not be grilled lamb or date cake, but still worthy of it’s own little post. 1. Make pizza dough. Once ready, roll out into a long rectangle, about 10x14 inches and move the dough to a parchment lined cookie sheet. 2. Mix together the mustard and mayonnaise. Set aside. 3. Layer the chicken and ham into the middle of the dough the long way. Spread the mustard sauce on top of the meats. Top with the onions, spinach, cheddar, maybe a shake of parmesan, and season with salt and pepper. 4. Stretch one side of the dough over the filling. Brush the folded top lightly with olive oil and stretch the other side over and press lightly to seal the dough and pinch together the ends. 5. Cover the dough with a cloth and let the dough rise for 20 minutes, meanwhile set the oven rack to the lower third of the oven and preheat to 375 degrees. 6. Brush the Stromboli with olive oil and sprinkle with Parmesan cheese. Bake for about 20 minutes or until golden and cooked through. 1. In a stand mixer bowl add the water, yeast, and honey and let sit for 5 minutes until foamy. Add the flour, olive oil, and salt and mix with the dough hook until well kneaded. I am sure that you will have another chance to take shots of the holiday dishes. I'm glad you're feeling better. 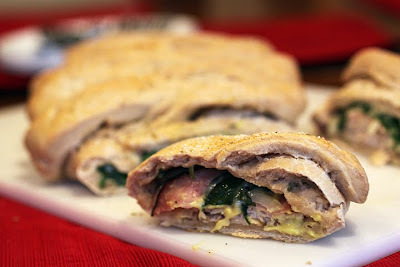 This stromboli looks very good! Hey, I was just thinking about strombolis yesterday! Mmmm - love your combination of ingredients. Hey there, thought you were suppossed to be resting :) Would have loved to have seen the maraschino tea-cakes. Would you perhaps one day make them again when you're feeling better? This stromboli looks fabulous too. I learn something new everyday! I've never heard of this dish but it sounds delicious... seems similar to a calzone? All I know is that if you bring this baby...I will bring the orange caky thing for dessert. I can see the steam rising from my piece, and now I want mustard, is that weird? All I can say is, wow! Can't wait to try this weekend. Thank you. I remember this photo and am glad you posted the recipe! It looks and sounds soooo good! Our dinner last night..not at all this..but it reminds me of the look:) Have agood day! Having a giveaway on my blog today. Come on by. What a great way to start the New Year. Your photo and recipe are both terrific. What a wonderful change from regular pizza! Love the filling and the thought of using whole wheat in the dough. Can't wait to see 100's of beautiful shots from you in 2010! Oh yeah! This sounds heavenly! Haha your post made me laugh. This is the best looking 'stromboli' i've seen! I haven't had a stromboli in years. Sigh. I had forgotten how wonderful they are. Not better than pizza, just different. And a nice change of pace. Thanks for whetting my appetite.